For children of divorce moving between homes is stressful enough without the transfers themselves being upsetting. There are many ways in which parents can turn simple transfers into real nightmares. First, attempt to minimize or eliminate parent to parent transfers even if you are not conflicted coparents. It is far more difficult moving from one loved adult to the other without feeling some loyalty struggle. 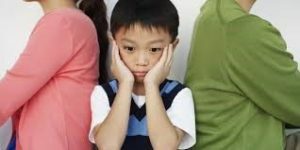 If you must have parent to parent transfers and they appear to be creating unnecessarily stress, following these tips. Keep your child’s transfer as brief as possible even if your child attempts to delay by trying to engage you in an activity with them. Say “hello” and “goodbye” to the other parent even if they do not speak to you. Your child needs to see that you are reasonable and civil in spite of the other parent’s action. Simple salutations only should occur at transfers. This is not the time for discussions. If the other parent attempts to start a discussion just say, “I’d like to speak with you regarding that but now isn’t the time. Give me a call or email me later tonight” and then walk away or get into your car. Do not carry your child at the transfer unless they are younger than two years old, asleep, or ill.
Do not give the other parent the silent treatment because this creates significant tension for your child. Do not involve the police for a conflict at transfer unless you believe you are at risk of serious physical harm. Just go in the house or get in your car to leave. Do not respond if the other parent makes negative and inappropriate comments while your children can overhear. Deal with this later when your child is in bed. If the other parent wants to video tapes the transfer this will make the children very uncomfortable. So say nothing about this and behave perfectly to give the video a chance to see you at your very best. Do everything you can to avoid creating drama for your child. Remain in the house or doorway and simply wave to the other parent and your child. Give your child their hugs and goodbyes inside prior to transfers so as not to delay the transfer. When you say goodbye to your child act up-beat so they will not feel sorry for you or worry about you when they should be excited to be spending time with the other parent. Tell your child you look forward to seeing them again soon but do not say more than once that you will miss them. If your children are old enough, and it is safe, remain in the home and let them walk to the car. If it is highly-conflicted you can put the children’s bags on the sidewalk so the other parent can get them after you go inside. If you had a grandparent or a significant other at home with you do not allow them to go outside to speak with the other parent. If your child is resistant to leaving do not carry them to the car. This will increase the chance of a parental conflict. Walk them to car and inform the other parent that they need to receive him/her. Make sure that your child’s bag is packed and they are ready to go prior to pick up. This will make matters smoother and less stressful. If the other parent arrives a few minutes early 5-10 minutes early, let your children go if they are ready. This is not a time for withholding, “just because you can.” Your children will recognize your maturity if you avoid playing this game. Remember you cannot withhold visitation from the other parent because they are late, or because they have fallen behind in child support etc. Money and parental rights such as parenting time are not tied to each other. Besides withholding parenting time would harm your child more than the other parent. If the pickup parent is running late and you have evening plans and the delay is impacting you then text or leave the other parent a note on the door letting them know that the children are up the street at a friend’s home waiting for pick-up. If your child requires medication, text the information to the other parent after pick-up, so there will be no need to discuss at the transfer. Show respect by arriving on time or texting if you are running late. Find a way to remain in the car if possible. Do not bring your significant other or anyone else that might antagonize the situation. If a witness is necessary, bring a neutral person and make sure they do not get out of the car. If your child requires a car seat or booster seat, make sure you have your own already secured properly in your car. Always make sure you have working seat belts for each child and that you do not place a young child in the front seat. If the other parent insists upon getting into your car to strap your child in the car seat, smile and DO NOT comment at all. Mention it later if you choose to do so but not with your child present. If the other parent demands you park on the street rather than come into the driveway just follow this request even if it seems ridiculous. If they do not want you on their property and the children have sports equipment or other large bags set them on the driveway where you pull up. Text before you leave to let them know the bag is at the top of the drive. If the other parent sends your child out with a pet that was not agreed upon you only have a few options. ) Make a fuss about how inappropriate and disrespectful they are and upset your child greatly 2.) Refuse the pet and look like the mean parent starting your custodial time off with a bang and a major meltdown or 3.) Acknowledge how excited your child is but do not comment about the other parent’s behavior. Consider your child first and take the pet this one time without complaining. Later after bedtime send a text telling the other parent this will not be tolerated again. Prior to returning your child make sure they understand if you cannot keep the pet. Place it in a cage outside your car when you drop off your child. Immediately send a text to let the other parent know to come and get the animal. When you return your child make sure to double check their bag to make sure they have packed everything. Make sure that the child’s clothes are all returned after a visit even if you do not have time to wash them. Make sure the items are all in a separate bag within their back-pack upon return. If you think that transfers are stressful for you, just imagine how they are for your child! Remember it is hard for most children, caught in a loyalty bind, to go directly from one parent to the other parent. It is much easier for children to go from one parent to a neutral adult. If possible, try to change the transfers to day-care or school. This will reduce the stress significantly. At parent-to-parent transfers children sometimes worry about showing excitement when they shift to the other parent. If you cannot reduce the stress by getting rid of the parent-to-parent transfers, at least remember the bottom line is keep it very brief, stay calm, act civil and realize your children are watching. ← What Should I Expect When Talking to My Child?